Automated Production Systems, Inc. was originally incorporated in 1982, and Novastar was established in 1989. To better serve the needs of customers, the two entities merged to form APS Novastar, LLC in August 2006. The original founders of APS Novastar, LLC based the business on the belief that they could make equipment simpler and better, while providing more cost- effective solutions for low- to medium- volume assemblers. The ability to provide hands-on advice to every customer through every sale became an early theme in the way the company did business, then and today. Our product line began with lead-forming equipment in 1982 as part of the APS brand. Wave soldering machines and reflow ovens followed under the Novastar name in 1989. In 1992, products were introduced for the low- to medium- volume SMT manufacturing processes of paste-place-reflow, with the roll out of manual stencil printers, manual pick and place machines, and bench-top reflow ovens. Throughout the 1990s and early 2000s, we continued to refine products to better serve our customers' needs with automated stencil printers and pick and place machines, along with high temperature, lead-free in-line reflow ovens. Further innovations on these machines included advanced vision-assist systems. DDM Novastar, Inc. was established in 2011 after the close of APS Novastar, LLC, formerly of Huntingdon Valley, PA, a suburb of Philadelphia. Many of the key people from APS were subsequently hired by DDM Novastar to continue the legacy started by APS in 1981. Our products are currently designed, developed and manufactured in nearby Ivyland, PA.
Diversified Design & Manufacturing specializes in the development of custom automation machinery and equipment, products that require precision and flexibility, providing an economical solution to our customers' manufacturing or testing processes. With our extensive knowledge of hydraulics, pneumatics, motion control, servo systems, machine vision systems, PLC and PC integration, Diversified Design and Manufacturing can provide complete process or product development services. Combine this with our in-house machine/model shop for precise component design and fabrication, and you've got the best source for your project. 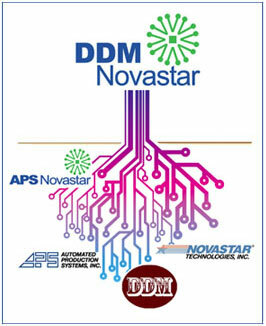 Now, with the key people in place, DDM Novastar expects to continue in the footsteps of APS Novastar as the global leader in design, development and manufacturing of OEM equipment for the short- to medium-run surface mount technology (SMT) and printed circuit board (PCB) markets. Moving forward in our mission of refining and developing products for low- to medium-volume manufacturing processes, DDM Novastar will continue to supply value-priced technology with superior service at competitive prices to meet our customers' needs. At Novastar, we don't just sell equipment, we specialize in educating our customers on processes, materials, equipment, and implementation. Customers choose DDM Novastar because we provide them with a total solution and assist them in obtaining the knowledge and advice they need to get the job done. We encourage you to visit us in our training, demonstration, and production facilities in Ivyland, PA.